Attributed to the Munich Town Guard, circa 1600. 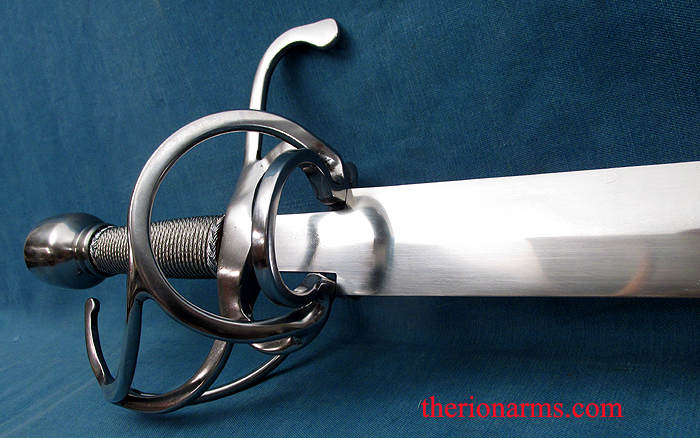 This sword is also likely to be the sidearm of a heavy curassier (i.e. 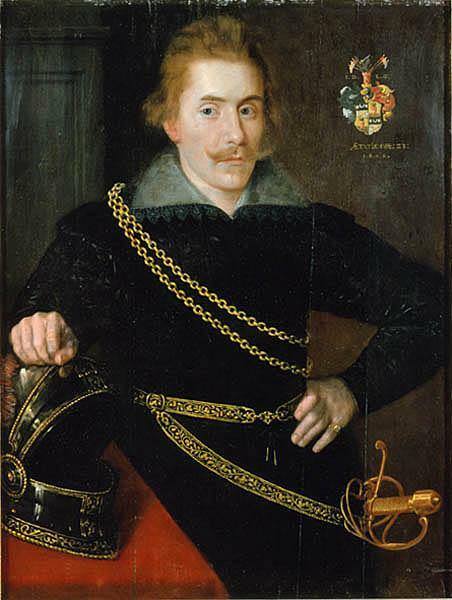 relatively rich dude in three-quarter plate armor with a rapier and wheellock pistols on a big horse), circa 1590 to 1610ish. Not to disparage the Munich Town Guard - major German city Town Guards were similar to the London Trained Bands - rather well off, well armed, and well armored influential gentlemen, not Keystone Cop or Discworld comedy guards. 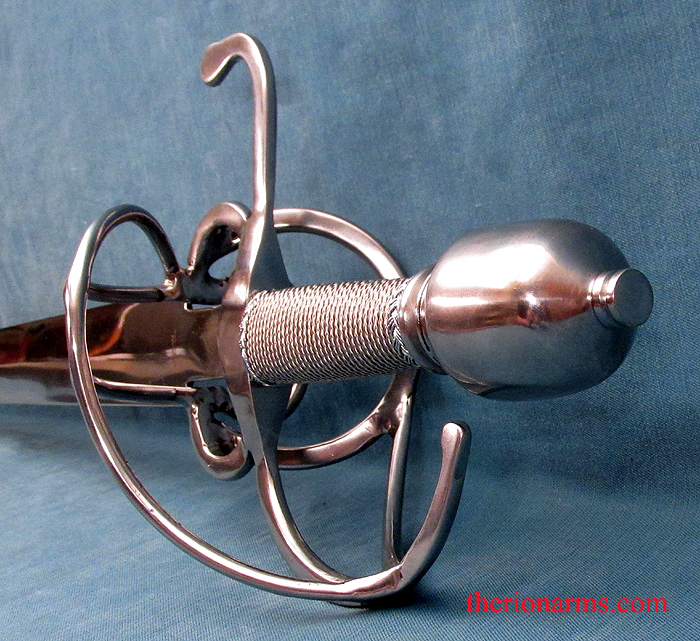 The original to the sword is in the Wallace Collection (sword A612), and similar examples can be found in Munich, The Tower Collection, The Bavarian National Museum, The Swedish Army Museum, and the Folger Shakespeare Library. 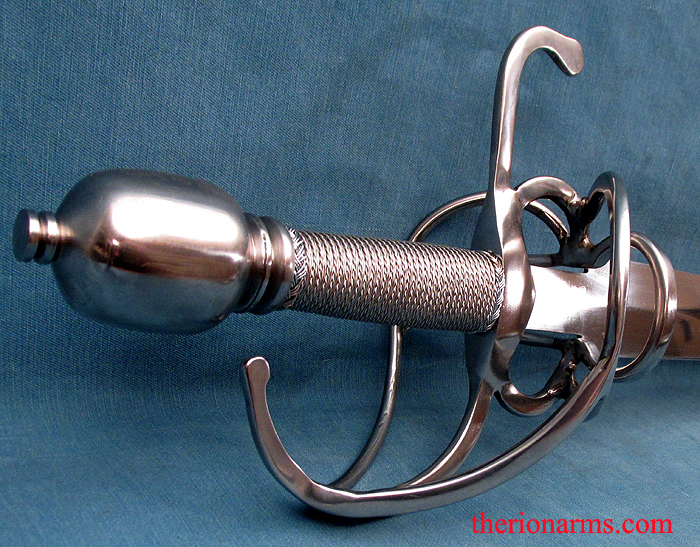 "A612 sword - Swept hilt, with pommel of flattened cylindrical form, with button; wire bound grip; single curving quillon, the end with slight horizontal recurve and widening at the end; Pas d' Ane, double ring, loop connecting with knuckle-guard, and two transverse bars on the inner side, the whole of blued steel; broad, two-edged blade of flattened diamond section, the narrow ricasso deeply stamped on either side with the maker's mark, the letters ST [the S above the T] crowned, used by Wolfgang Stantler, the Munich bladesmith. 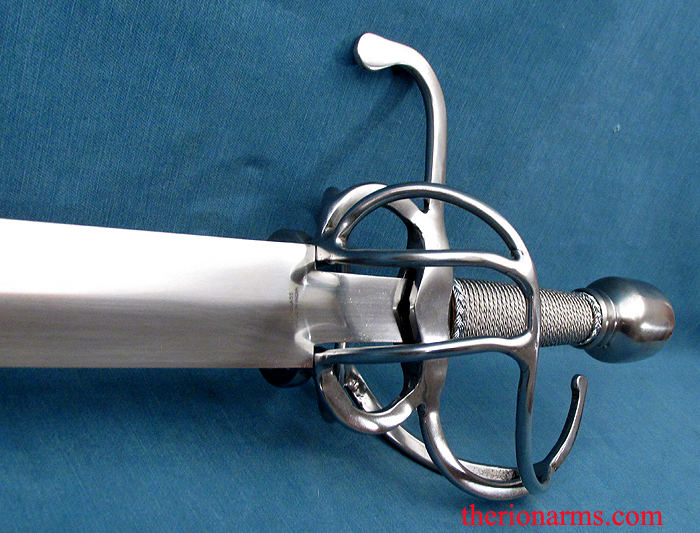 German (Munich), about 1600 - This sword belongs to one of three classes of early XVIIth-century cavalry swords, of which large numbers are in the Bavarian National Museum, Munich. They were formerly in the Bayr. Arme-museum, when the late Dr. Stecklein disposed of many surplus specimens by exchange. These are now scattered among many collections. 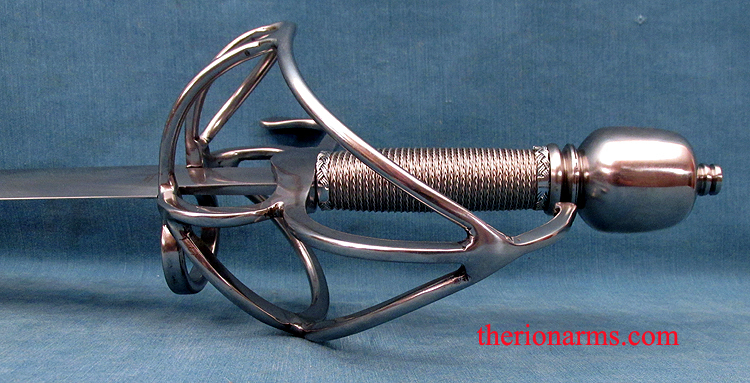 Examples which left Munich, like this one, at an earlier date, are in the Armouries of the Tower of London." 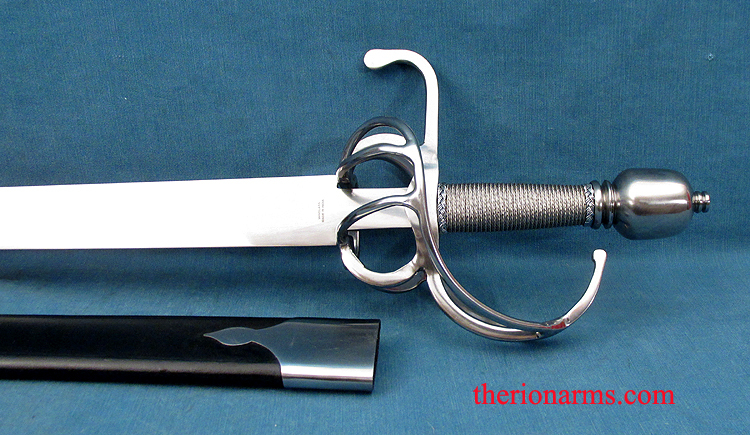 This reproduction has a tempered 1095 high carbon steel blade, steel pommel and guard, wood wrapped in twisted steel wire grip. 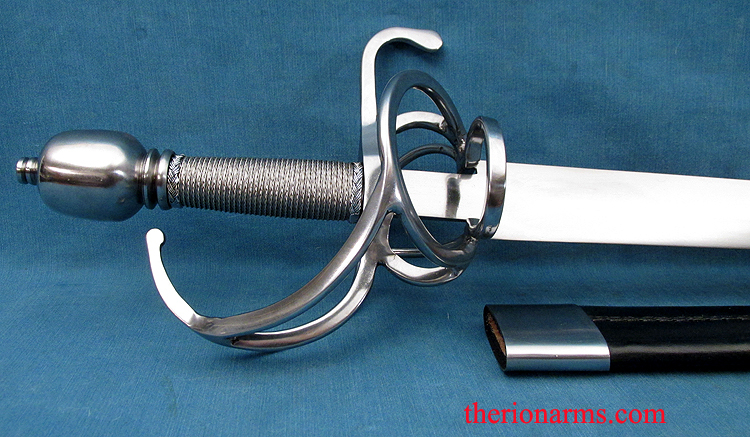 Leather covered wooden scabbard with steel fittings.